The time period for nonresidents to apply for a coveted Fall 2010 Iowa archery deer license is May 1 through June 6, 2010. My advice for dedicated whitetail chasers? Do it. For one, if you’ve never applied for an Iowa license, it will likely take you a minimum of two years, and very likely three, to obtain your license. And two, when you finally get to bowhunt this great state and its abundance of giant whitetail bucks, you may never be the same. This year the Iowa deer bow season runs Oct. 1 to Dec. 3, and Dec. 20 to Jan. 10, 2011. I’ve been lucky enough to bowhunt Iowa several times over the past 15 years, but my most-exciting hunt, hands-down, occurred just last fall. Early November found me traveling from my Minneapolis-area home to the state’s southern tier, where I met up with a group of young, dedicated bowhunters who had been anticipating Iowa’s Fall 2009 hunt every bit as much as I had. Kevin, Jay, Zach, and Dan had prepared well for the season, carefully setting their digital trail cameras well in advance of the season, then building portable hunting blinds and setting hang-on treestands and ladder stands where they’d captured images of the biggest of the many bruiser Iowa bucks cruising their scattered, agriculture-laden parcels. All tracts, I would find, held some of the best-looking “big buck” habitat you could possibly imagine. As is typical for me at that time of year, I was an organizational mess, having just returned from a week-long northern Minnesota bowhunt, and logging several hectic days at the office. Operating almost on autopilot, I soon found myself packing hurriedly to meet up with my Iowa buds to the south. After quickly throwing my bow gear into my vehicle and driving about six hours, I met up with Jay and Zach at a rural convenience store near their hunting grounds. 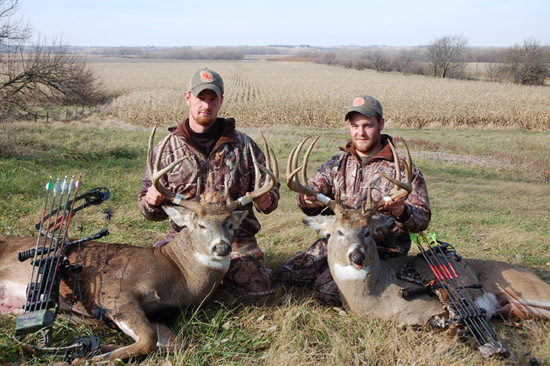 Jay Willenborg, left, and Zach Kathol pose with their 2009 Iowa monsters. To be honest, I was looking forward to following them to a friend’s farmhouse, which we were set to use as our “hunting camp.” My bow gear, including treestands, a portable ground blind, hunting calls, optics, camo, and more, was badly in need of some deft organization. Or at least some type of organization. But Jay had other plans. “We want to get out there right now; the bucks have been really moving,” Jay said all too matter-of-factly. I needed no other prompting. “Give me 15 minutes,” I replied. As I crawled into my hunting duds in the busy parking lot I learned that Zach had arrowed a tremendous 165-class, 10-point monster just two days previous, and Jay reported deer movement since then had continued to be exceptional. I also had time to peruse a few recent game-cam images that set my heart racing. All featured jaw-dropping bucks of various proportions. Thirty minutes later, Jay was leading me across a rolling cow pasture, finally stopping a few hundred yards from a well-hidden creekbottom stand that he quickly explained had been hunted only lightly during the early season by his small group of buddies, producing a few encounters with some average bucks. “But we haven’t taken any deer off this farm the past two years,” Jay hissed. “You’ve gotta figure there are some absolute monsters holed up in here.” Indeed. Jay’s last words to me were all too prophetic. Luckily, even in all the hurry-up confusion I’d remembered to pack my Knight & Hale Pack Rack, an ingenious, ultra-compact rattling device that had already proven itself to me during my previous Minnesota bowhunt. It was on this hunt that I’d managed to use the Pack Rack to rattle-in a bruiser bigwoods whitetail to just 12 yards—no doubt duped by the realistic-sounding device that improves on natural antlers by being able to fit conveniently in a daypack, or even a side cargo pants pocket. And almost as important, the unique call is absolutely silent in transit. Another huge benefit. Just an hour into my sit I looked up to glimpse a lone mature doe making her way steadily toward me. She looked as though she might have a rut-crazed suitor following, so I held off on attempting to fill my bonus Iowa doe tag. Soon the old girl was inching by me at just 23 yards, but another 30 minutes of waiting had me itching for more action. Not one minute after my very first rattling sequence had ended a small six-point buck came running in on a string, ending up right under my treestand. Now this was more like it! The curious young deer didn’t have a clue, and I busied myself watching it for the next few minutes, simultaneously watching for other deer to respond. I wouldn’t wait long. As I carefully bent around to my left and peeked behind me, I froze. A huge set of antlers was closing. Fast. To be honest, the deer was so massive it almost looked fake; immediately I glimpsed a kicker off its right G2 and thought it to be a huge nontypical Jay and Zach had earlier caught on trail camera. But then just as fast I remembered that deer had been on another farm, miles away. Luckily my body was working simultaneously with my brain, and I found myself instinctively positioning for what was looking like a “slam-dunk” bowshot…at the largest whitetail of my life. Holy Hannah! The huge buck was on a wide, open cattle path that paralleled the tiny creek and passed just below me at 18 yards; the deer was just entering a 10-yard stretch of fairly thick brush that effectively hid my draw from the deer’s eyes. In a nutshell, the stand was very well placed. Later the same week, Kevin Sturm would arrow this beauty 140-class 10-point. As if part of a script, I calmly reached full draw, undetected, and waited for the deer to clear the brush. On it came, and I was just about to squeeze off a shot when the big deer nonchalantly stopped…and turned back to work a scrape. It was mere inches from my lane! Slightly unnerved by the deer’s sudden move, my mind raced. Then my heart kicked in. The deer was completely relaxed and stopped, just inches from my shooting lane, but now pointed in the opposite direction, making a scrape. In one of those split-second decisions bowhunting sometimes demands, I decided to get aggressive. Still at full draw, I leaned out as far as I dared—with the new perspective opening up what looked like a clear path to the brusier’s lungs. At my release I heard a “thwack!” and saw the arrow jump nearly two feet over the buck’s back! What? Unfortunately, the late-afternoon shadows had effectively hidden an overhanging tree branch. I had to have centered it. Obviously, the shot was not as clear as it appeared…one disadvantage of so much fast action at an unfamiliar standsite. At the sound the buck froze; I could see my arrow had buried into the edge of the steep creek bank maybe 20 yards away. Now nearly in shock, I could only watch as the buck of my dreams simply turned and slowly walked out…and into my wide-open shooting lane! Then it did a peculiar thing. It stopped. Resigned to the fact that I’d never get two opportunities at a buck of this caliber, I simply stared at the huge monarch. I marveled at its incredibly wide, freakishly massive 8-point rack, complete with dagger-like G2s, a forked brow tine, and stickers. But maybe even more impressive was the deer’s body…easily the largest I had ever seen. Ever see a buck make itself look larger by “bristling out” its hair as it approaches a rival deer or a decoy? That’s what this one looked liked relaxed. Three hundred pounds? Easy. More? Very likely. Incredible. Then I snapped back to reality. This deer wasn’t bolting! It was just standing there! Having nothing to lose, I slowly reached for my quiver, which I’d removed and placed atop the site’s second hang-on stand, positioned for use by a cameraman, just above me. Incredibly, I was able to snake out an arrow, one-handed, and get it nocked, as the deer turned slowly beneath me…some 24 yards away. By now at least a minute or more had passed since my first shot…an eternity. I knew my window of opportunity was closing quickly. As that thought crossed my mind the now-nervous deer pivoted around once again, and seemed ready to bolt. But it was now broadside. Almost in one motion I reached full draw, lowered my 20-yard pin and released. Again I watched in horror. My arrow seemingly had hit high, just over the deer’s lungs. It whirled and sprinted 40 yards, just out of sight, then stopped. Had my shot been better than it looked? I waited for the sound of a fall. But it never came. Silence prevailed. Still frazzled, I texted Jay about my encounter, and my guess of a poor shot that would require a serious wait before trailing. But Jay had his hands full with his own encounter. 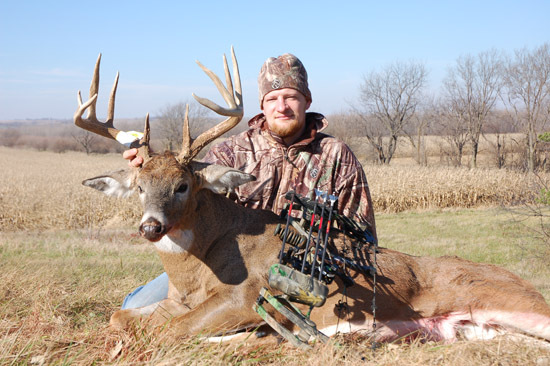 “I just shot a monster…and mine is down and out,” came Jay’s reply. Wow. As Jay had predicted, the area’s big bucks were indeed on the move. After a brief phone conversation it was decided I’d leave my deer till morning, and Jay would pick me up so I could be in on his buck’s recovery. Slowly and silently I snuck out of my treestand and inched up the hill so as not to spook my buck. I soon learned Jay had shot his beautifully symmetrical 160-class 10-point from a homemade ground blind set on the edge of a cut alfalfa field. The drawing card had been a large buck decoy that had worked like a charm. Upon seeing his “rival” the 10-point had come in stiff-legged with hair bristling. Jay made a perfect double-lung shot and the deer piled up in sight, just over 100 yards away. A truly spectacular Iowa whitetail. On a much sadder note, Jay, Zach and me spent a good chunk of the next day searching for my buck, but after the very short, faint blood trail ran out we found neither hide, hair, nor arrow. But there is a silver lining to this tale. Incredibly, this past March I was contacted by Kevin and Jay, who told me their crew had found a right-side shed from a deer matching the description of my buck. The find came not far from the treestand I was in that fateful day. After seeing a photo of the shed, there’s no doubt in my mind it’s the same buck. More good news came a week later, when the guys heard that the left-side shed, sporting the distinctive split brow tine, was also found, by the landowner. So there it is. My dream buck is still out there somewhere, apparently no worse for wear. The scary thing is this: Come this fall, he’ll be even bigger. 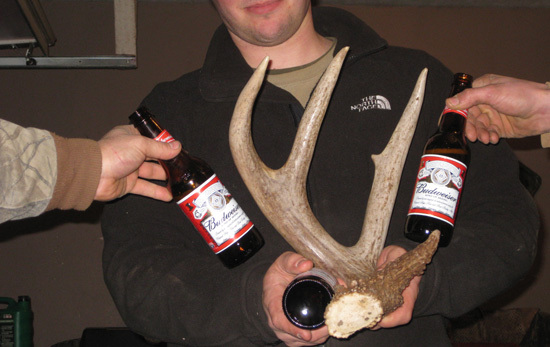 Here's the right-side shed from the buck I shot in November 2009. The good news? The shed was found in March 2010. (The beer bottles, I was told, are merely shown for mass reference). A note for “first-time” Iowa deer license applicants: Anyone unsuccessful in the “Any-deer/Antlerless-only” combination license drawing will be given one preference point and assessed a mandatory, nonrefundable $50 preference point fee. To apply for a license via phone call (800) 367-1188; to apply online, go to the Iowa DNR website.